Basket making tuition is offered for beginners and more experienced basket makers using a variety of basketry techniques. Tuition can be arranged for individuals or small groups of up to six people. Please contact for details and costs. does not take up a lot of time. 1pm to 4.30pm. venues can also be arranged. Details on request. any travel and accommodation expenses. Catherine has a long standing passion to promote recycling and has developed this interest to be able to offer courses in weaving baskets from recycled materials such as juice/milk cartons, newspaper/magazines and plastic bags. This is a useful course for the Schools’ Eco Week or Green /Recycling promotional events. 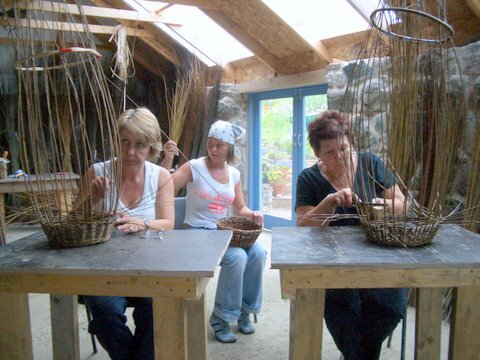 These courses are organised along the same lines as willow basketry courses, but participants are encouraged to provide their own materials. Please contact us for costs, which will include any travel and accommodation expenses.